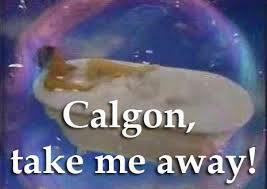 Okay, remember the commercials for Calgon? Well, I guess Calgon took all the people away. You never see this ad on TV anymore. I thought I might try some, but we don't have a bathtub. So, I'm thinking of getting a box and sprinkling it on me then stepping into the shower. I just hope it takes me away ... someplace far, far away.